Today is International Holocaust Remembrance Day, in observance of the genocide of an estimated six million Jewish people, two million Gypsies, plus 250,000 mentally and physically disabled people, including those with epilepsy, and nine thousand homosexual men by the Nazi regime and its collaborators. The regime’s first victims, as early as 1939, were adults and children like my son Calvin, who were deemed as “useless lives” because of their physical and intellectual disabilities, and whose gruesome executions were meant to improve the economy and cleanse the Aryan race. The code name for the euthanasia law was "Operation T4." In the years that followed, millions of others met the same fate in Nazi gas chambers and suffered torturous medical experiments meant to discover how best to extinguish a soul. I’d like to think that Western societies have learned from this atrocity and thus divorced themselves from these kinds of fascist beliefs. Regrettably, I know that is not true. I know because today I see fear, hatred and contempt for others seething in the hearts of some we know. I know because people like Donald Trump spout that Mexicans are murderers and rapists, and calls for the rounding up of Muslims, and mocks disabled people, and openly expresses his disgust for women. I know because wicked white supremacy is alive and well. I know because I see six white high school girls smugly spell out the N-word, each letter shaped with gold tape on their black t-shirts, substituting asterisks for Gs; they photograph it for the world to see. I know because I hear so many people who blame immigrants and poor people and minorities for society’s ills, want to round them up, drive them away, shut them out, knock them down. I know because people still stomp on the homeless and beleaguered rather than lending them a hand, a shoulder, an ear. In remembering the Holocaust today—the nadir of recent times—I tightly embrace and revere the diversity in this nation and, most of all Calvin who, unlike anyone I know, is as pure and sparkling an example of what I find best in humanity: the ability to love, accept and embrace everyone, no matter who they are, what they look like, or where they're from. 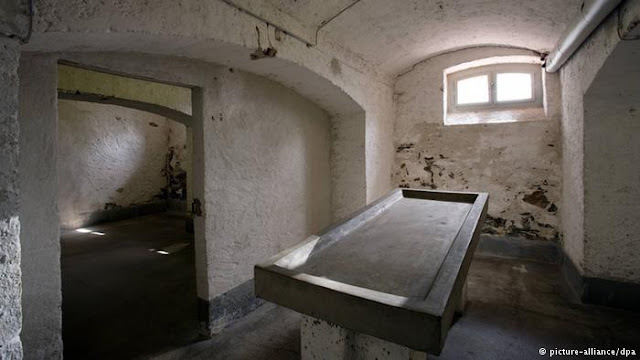 From 1941 people with physical and mental disabilities were killed at a psychiatric hospital in Hadamar in Hesse [one of six similar locations]. Declared "undesirables" by the Nazis, some 15,000 people were murdered here by asphyxiation with carbon monoxide or by being injected with lethal drug overdoses. Today Hadamar is a memorial to those victims. we can learn basics from Calvin--love, acceptance, no conditional anything.....how sweet and clear...how nourishing.. how important! I'm trying to read a book about autism, "Neurotribes" but almost couldn't get past what happened to autistics under the Nazis. Although psychiatry in the past century has been almost as cruel. I had to put the book down for awhile. my husband just finished that book. atrocities.